This post is dedicated to the memory of Gordon James Peter Squire, above, whose funeral I attended today. That’s him, on the left in the picture, with me in the middle (pulling a stupid face), my mother and my brother Nick in the striped hat. Gordon was (I still find it hard to type that past tense) the patriarch of a family I have known all my life. Our families have been friends ever since my parents moved to Staffordshire in 1960. As in my family, they had four children and we all grew up together, from playing to partying. Since my father died thirty years ago, Gordon and his wife Norma have been the very best of friends to my mother. They have always been the ones, of all my parents’ lovely friends, who we all really looked forward to arriving at parties and we had so many happy times at each other’s houses. Gordon’s death has made me feel very poignant – and although I have shed tears, I can’t be gloomy sad, because he was 86 and really had the very best of lives, with the closest and most loving family anyone could wish for. As a testament to that, two of their daughters live in houses literally on either side of their parents, so they have a kind of compound with the grandchildren constantly running around. My only-child daughter has spent some of her happiest times there, having a glimpse into what it’s like to have a bunch of really fun brothers and sisters to hang out with – and although they’re all older than her, she is always made to feel one of the gang. Gordon held a place in the affection of me and my siblings second to none. He was of a breed of Englishmen rarely seen any more. A true gentleman. Perfect manners – but never stuffy – always immaculately dressed whether he was hosting a Christmas party, tending the barbecue (a particular passion of his), or helming his yacht. As seen in these pictures. He was very well read (Rugby, Cambridge) and a joy to talk to. He had that quality of always appearing to find what you were saying particularly interesting and he was the same with everyone, whatever your age, or station. Testament to that, many people who work on the shop floor of the family business attended the funeral today. I chatted to one who has worked there for forty years. And it’s not just any old business. 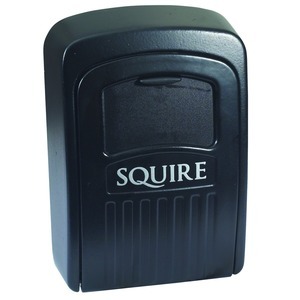 Squire Locks, manufacturers of security devices, was founded in 1780 – six generations back from Gordon. His son John is now managing director, making it eight generations. Gordon didn’t just run the business very successfully, he was closely involved with technical and marketing innovations, introducing bubble packs to the UK in 1960, after spending a year studying the market in the United States. But beyond all those reasons to admire him, Gordon was special to us because he felt like such a link back to our own lamented father. 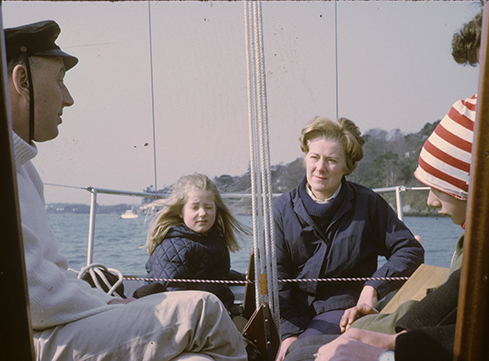 The same dress code and manners, immaculate fingernails, never seen unshaven – and a shared love of sailing. 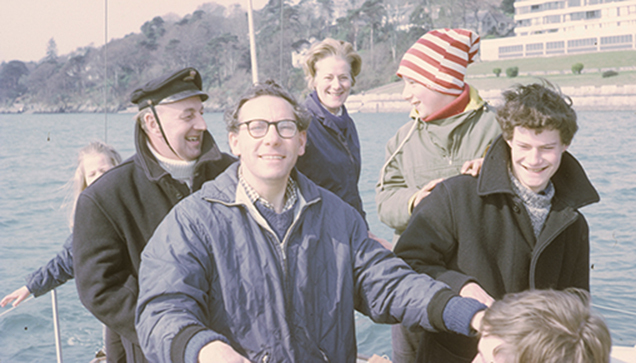 My eldest brother Freddie (on the right in this picture) – currently living on his own yacht in the Caribbean – crewed for Gordon several times, on races across the Irish Sea, several of which they won. With my best friend Victoria, I was once recruited to cook on a week’s cruise with Gordon and three of his pals, across to France. I hope we did him credit, we certainly had a hilariously good time. I still can’t quite take in that I will never see that very particular smile again and look forward to my moment at an occasion when I would get to chat to Gordon. The funeral was a very fitting tribute, followed by a lunch at a local hotel, with the entire Squire clan, two of my siblings, my mum and all the family friends who have known me since I was a baby. Although it was convened for the saddest of reasons, it was a joy to be there. And I had one bittersweet little moment of my own. When I popped to my mum’s house (which she’s no longer living in) to get her good black coat, I went to the outdoor safe to get the keys. It sounds like he lived a good life and will be much missed. I’m sure it also brings the wounds caused by losing your father so young to the surface. What a sad day but how wonderful that you could gather together to celebrate the life of this special man. I also love that your mother has a ‘good’ black coat – now we are seeing where you get your extensive wardrobe habit from! I met Gordon Squires here in Sydney when he visited one of his daughters who was living here at the time. She is a good friend too. A charming family. This is a beautiful tribute to a life well lived. Family friends like that are like gold. And – I thought it was you when I looked at your mother. Good genes!